Binocular Rebellious - ZineWiki - the history and culture of zines, independent media and the small press. 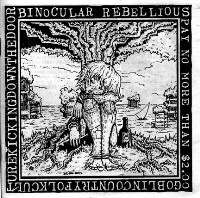 Binocular Rebellious was a punk zine, published in Oakland, California in 2003 by Goblinko and produced by Sean "Goblin" Aaberg. The zine was produced as an attempt to get back to and explore Sean's Punk roots, which he had been ignoring for some years. Clint Marsh of Wonderella described Binocular Rebellious as follows. "Sean is a bit of a land-based culture sponge, and his self-imposed exile from the land of punk five years ago saw him wend his way through several strange kingdoms of art and philosophy, sopping up the best ideas and expunging the dross. The first issue of Binocular Rebellious tells this tale and outlines Sean’s fantasy-fueled dream of the free-thinking, cider-soaked utopia that lurks beneath the cynical crust coating the soul of each and every one of us." Binocular Rebellious worked at tying in the post-apocalyptic Punk world with the Folk Fantasy world. Binocular Rebellious was reviewed by Joe Biel in the 2003 issue of Best Zine Ever. This page was last modified on 3 December 2007, at 16:32.